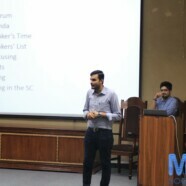 Muazzam Khan Lodhi was guest speaker at the second session of the MUN summer camp. The former member of the MUN society dived into great depth of what the UN is, starting from its conception after World War II in 1945. He then introduced the 6 basic organs of the UN, and each of their functions to the attendees on 9 June 2015. He explained the role of The Security council, its members and the role of their veto power. Muazzam went on to shed light on the purpose of the formation of the UN. He was also mindful to address the faults in the UN. Next the audience was given a detailed analysis of Model United Nations, its purpose and the rules of participation. In reference to personal experience he gave a step by step tutorial on how to successfully “MUN”. 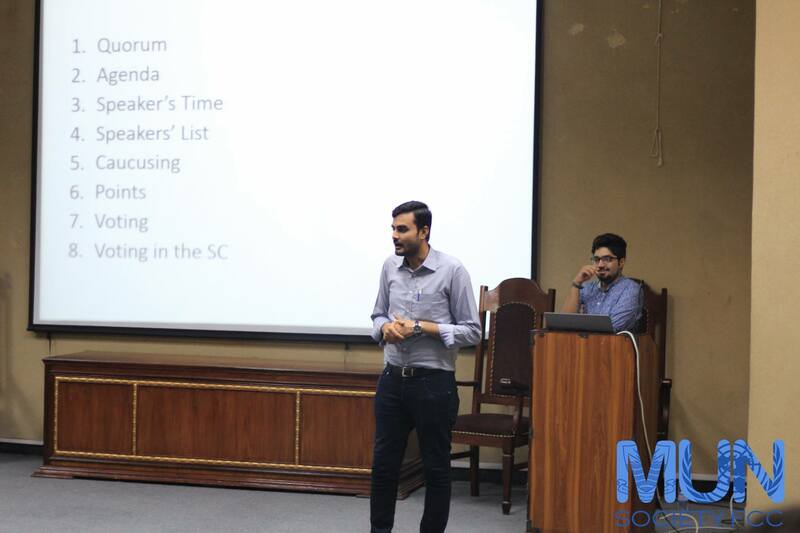 He explained the committees one might come across a MUN and what the purpose of each is. Towards the end of the session, we mentioned the 4 non members of the UN and their reasons of not joining. But finally, he elaborated on the concept of state, government and the difference between the two. Figuring this out was an example of how one should research for a MUN session which was the ending note of the second day of MUN summer camp. A little background history of Muazzam Khan Lodhi, he has won awards in every MUN conference he has been in and has won the Best Delegate award at the MUN held at Munster University, Germany 3 years in a row. He has represented Pakistan at various international forums including France, Germany, India and Spain. Now that is a true achievement you can all look up to. He has also won the roll of honor in both Debates and MUN in Punjab University. Apart from all that, he is also an extremely great and fun person to be around. Just ask all the people whose committees he has chaired!